Toys“R”Us engages its tough-to-reach retail population with fully integrated bilingual campaigns and an award-winning benefits website. Fun and simple. Those were the words that popped into mind when Toys“R”Us asked us to create their benefits communication website. The giant retailer had nearly 1,550 stores all over the U.S. and an ethnically diverse workforce. The majority of their previous open enrollment messaging was delivered in print. Team members were receiving handbooks that sometimes read more like legal documents than something a family could use to make smart choices. Toys“R”Us needed a website that could reach everyone—from the people in the distribution centers to the people in headquarters—and their families. 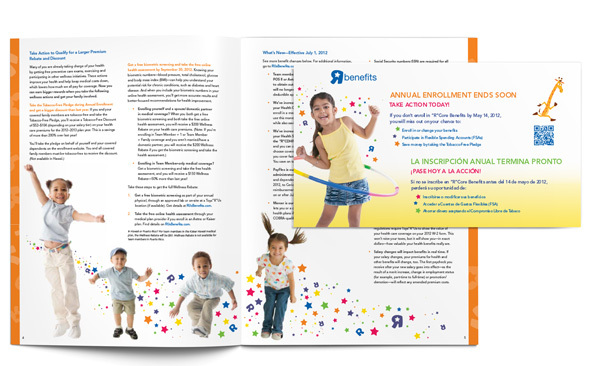 We used their brand’s fun colors and graphics, simplified the communications into language people could understand and created a fully integrated bilingual benefits website. The site—which featured more than 100 pages of benefits material and an interactive benefits blog in English and Spanish—set a new standard in the industry. The site also won an EBN iCOMM award for Best Web or Intranet Design & Usability! We’re honored and proud to be recognized for our partnership with Toys“R”Us. And we’re excited that team members and their families at Toys“R”Us now have a benefits website that can help them make important decisions. Launching a new Internet site resembling a one-stop shop for benefits communication can be an undertaking for any organization. Redesigning and refreshing such a site less than a year later is an even more ambitious venture. For Toys“R”Us, delivering such a platform was a paramount objective to providing employees the tools and information they needed to make critical decisions about their benefit plan options. At the center of this initiative is Michael Greenberg, senior director of benefits and relocation. Greenberg led the effort to launch and redesign RUsBenefits.com, Toys“R”Us’ intranet platform, in 2010 and 2011, respectively. To add to the degree of difficulty, each year the site launch coincided with the annual open enrollment period. RUsBenefits.com enables us to provide up-to-date information, rapidly deliver news and plan design changes, and offer interactive decision support modeling tools, videos and channels for sharing benefits plan experiences. We know employees constantly rely on technology. Following the launch in 2010, the benefits team at Toys“R”Us did extensive research to analyze employee usage, and disseminated online surveys to collect feedback on the elements of the site that were effective and those that could be improved. Focus groups were also formed to hear how workers would improve usability of the site. Greenberg and the benefits team paid close attention to the compilation of responses to deliver an even greater user experience to employees when the redesign was unveiled in April. The benefits team knew the company had an opportunity to make the site even more user- friendly by improving navigation, headings and by adding new content. Response to RUsBenefits.com has been very positive. Employees, and the HR generalists who support them, are now able to rapidly find benefits information. This has reduced administration, allowing the benefits team to focus more on strategic planning. The redesigned site now features Spanish translation, helping Toys“R”Us deliver benefits communication to a broad segment of employees. 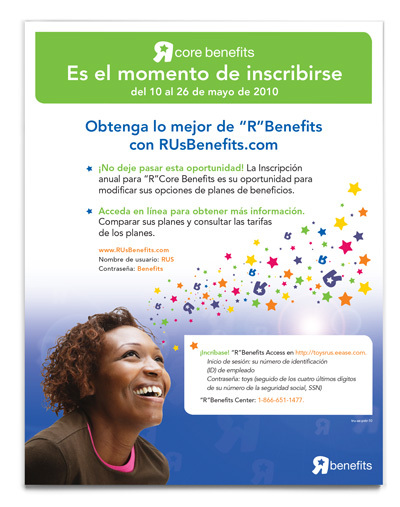 Today, the company offers a Spanish version of all communications found on RUsBenefits.com. Greenberg says this is part of the organizational commitment to ensuring all eligible employees understand the benefit options Toys“R”Us offers. With blogs that stay fresh through interactive video and RSS feeds, RUsBenefits.com is embracing technological advances to make the site a fun and engaging experience for a growing viewership. 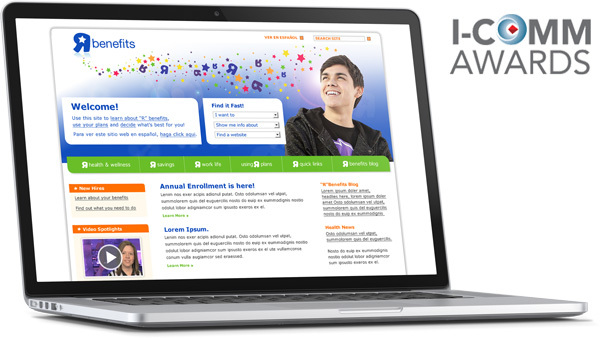 Online traffic during annual enrollment increased nearly three times in 2011. Employees are also spending a considerable amount of time on the site, averaging nearly 10 minutes per visit. A central goal is that the site provide the opportunity to get benefits communication in front of the families of Toys“R”Us employees. The site has become a trusted source for households to make important decisions together in regard to their medical and financial futures. Partnership among Greenberg, the benefits team and numerous other groups was key to success. Information technology, HR, communications and marketing, vendor partners and a benefits communication firm were all at the table to help coordinate and facilitate the launch and redesign of RUsBenefits.com. We see consistent usage all year long. It is the first place newly eligible employees are directed for benefits information, and it serves as a reference for all employees and their families. We believe we have the right communication channels in place to introduce new programs and features in the future, such as more wellness and voluntary programs, but we are always looking for additional ways to improve.